Go to the Timex Sinclair 2068. 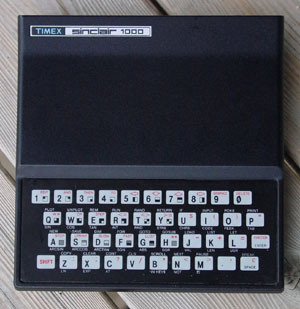 The Timex Sinclair was one of the first affordable personal computers, housing a Zilog Z80 microprocessor and a version of Basic in ROM. I didn't own one until 2001 (which I picked up from the Austin, Texas Goodwill Computer Works for $5), but my good friend, Steve had one on which we spent a little time doing some simple programming. 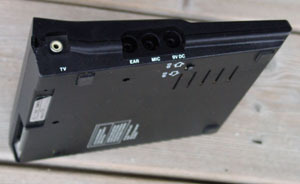 It had limited abilities, in terms of its built-in 1kB RAM (expandable to 16kB by plugging a module into a port on the back), cassette I/O based storage, no audio, and miniaturized membrane keyboard sporting special programming command key modes. It was capable of black and white (4 level grayscale?) text and graphics via tuned (channel 3) composite output.